Here are some fun, quick and easy Eid craft ideas for kids of all ages, using simple craft cupboard ingredients. We've also linked to our Chinese lantern crafts below, as these can be adapted for Eid celebrations by using traditional Eid colours. Every Chinese New Year ends with a beautiful display of lanterns at the Lantern Festival. Your children can make their own colourful Chinese lantern craft for your Chinese New Year display. This lantern can be adapted for all ages of kids. This Chinese lantern craft is quick and easy to do, but a string of them hung across a room looks bright and pretty and perfect for a Chinese New Year or Lantern Festival display. This is a simple technique for children to master but the resultant Eid silhouette picture is beautiful. 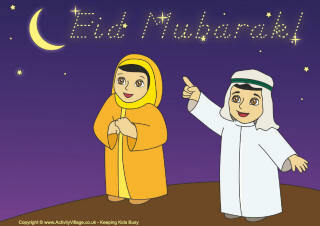 Use for a special Eid card, or put your picture on display. We've taken inspiration from Islamic geometric designs for this pretty stained glass window craft idea for kids. Plenty of glue and patience will be needed to make this lovely glittery star - but what a lovely craft you will end up with to put on display at Christmas or Eid! This mini Chinese Lantern Chain is very quick and easy for kids to make, and as you can see from our photo, it looks absolutely spectacular! A great way to brighten up your home or classroom for Chinese New Year! Here's a simple potato print Eid card that even the youngest children can make - but it is sure to appreciated!